Duplicate A4 Carbonless Books. Printed 1 colour on quality NCR paper stock. 50 sets of forms per book. Price includes, cover, fold in writing plate and is numbered consecutively with books having top copy perforated and bottom copy fixed. Books are quarter bound with crocodile board cover, pads are standard pad bound with a soft cover. 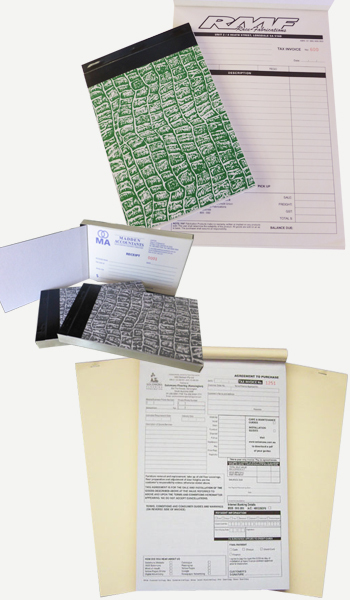 We print custom invoice books, purchase order books, receipt books, quote books, docket books, carbonless books, custom invoice books, personalised invoice books, cash receipt books, all with carbonless printing.